Eamon McMeel, Technical Sales Manager with V-Mac Silos welcomed the recent announcement by Minister for Agriculture, Michael Creed, confirming that Meal Silos will be eligible for TAMS 11 Grant support with immediate effect for all farm sectors. Eamon added “this is wonderful news for all farmers who are looking at improving their animal feed storage capability and we are delighted that the Minister has responded positively to our call to extend Grant eligibility. this grant supports farmers who are looking to protect themselves against feed shortages and improve biosecurity. Farmers can save upwards of €30 per ton by buying in bulk. or €1900 (on an existing base) plus an additional €68.50 per cubic metre capacity. For example, a 10 ton single silo reference cost is €2200 plus (17m3 x €68.5 = €1164.50) totalling €3364.50. The reference costs for Split silos have been improved significantly reflecting the additional costs associated with Split silos. This is potentially of major benefit to farmers as Split silos offer many advantages. You increase the efficiency of the farmyard space; you can store two feeds in the one silo as well as using one feed system to handle both feed mixes. As with all grants, there are terms and conditions which must be adhered to, but to be fair they are fairly straightforward in relation to Meal Silos. The concrete for the Silo base must be a minimum of 3m x 3m by 250mm thick. McAree Engineering specify a base 300mm thick for all silos up to 16 ton capacity. Also, the concrete for the base should be grant approved concrete of 37 Newton concrete. All silos will need to be supplied painted unless the silo will be erected inside an existing building. The current scheme is already open and applications need to be submitted before 5th April 2019 – so you are advised to contact your agricultural advisor as soon as possible. The application requirements are straightforward as well with just a farm yard sketch being required, showing where the silo will be positioned. V-Mac silos are constructed using Magizinc, a modern steel that provides the extremely high levels of protection against corrosion and with their exclusive of interlocked forming and incredibly strong. McAree Engineering has been helping farmers to protect their feed since the 1960’s when Vincent McAree designed and manufactured the very first V-Mac feed silo. 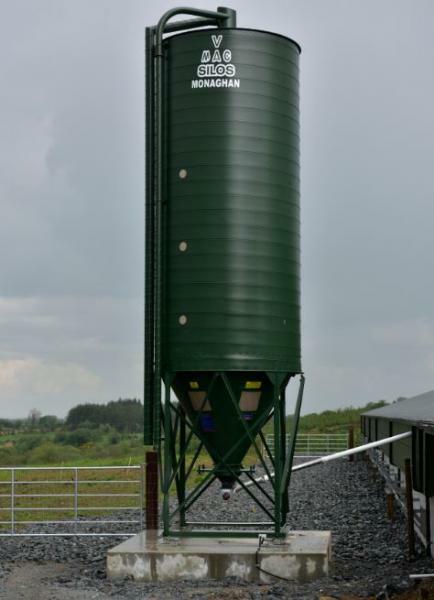 The UCD research farm at Lyons Estate and various Teagasc agricultural colleges are among the many farms where the award winning V-Mac silos can be seen in operation. Next News Balla Weanling Sale 2nd of February.